This day November 27th in 1703 was the last day of a ferocious storm in Britain. 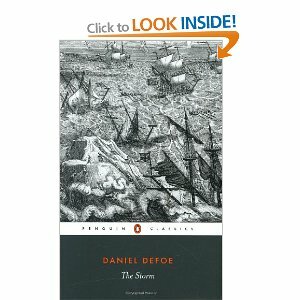 It was the most dramatic in the nation’s recorded history and would inspire a novel “The Storm” by Daniel Defoe. Britain may be a land used to rain and clouds and soggy summers BUT it is not a country accustomed toÂ hurricanes. All that changed in mid November 1703. Â A storm of unequalled ferocity arose at this time which would sweepÂ acrossÂ the country and leave death and devastation in its wake. In the English channel hundreds of Royal Navy vessels were sunk . Somewhere between 10,000 and 30,000 people were killed. The storm began on November 14th.Â PowerfulÂ winds swept in from the Atlantic Ocean battering the cities and towns along the coast in the south and west. On November 26th winds reached 80 miles per hour. Buildings were torn apart and Â bricks and beams of wood thrown through the air. Â The storm devastated Plymouth, Portsmouth and Bristol. The situation got worse when as many as 300 Royal Navy ships in the channel were lost with as many as 8000 men aboard. On the river Thames waves reached six feet higher than ever before recorded destroying 5,000 homes.